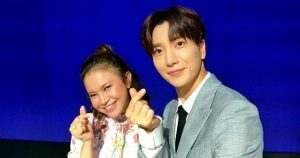 Koreanboo – Netizens still can’t believe that Super Junior will be collaborating with Indonesian icon Rossa but everyone is incredibly excited! On February 21, representatives from SM Entertainment including Lee Soo Man met with the president of Trans Media and the chairman of CT Corp in Jakarta to establish their new partnership with the company. Trans Media and its parent company CT Corp is a business group leading the media, retail, and finance sectors in Indonesia. Through this partnership, SM Entertainment and Trans Media hope to launch a joint business venture that promotes not only the entry of SM Entertainment artists into Indonesia but also to promote the production of Indonesian pop and video programs. Which means Indonesian artists will be collaborating with SM Entertainment artists. Fans found out that top Indonesian artist Rossa was going to be the first artist to be recruited when the meeting was held and then they found out that a collaboration with Super Junior is already in the works! To top it off fans also found out that the special music will be releasing sometime in the latter half of this year and the anticipation was already in the air! And even though it’s been a few days since the news first went out, netizens are still expressing their excitement over the whole project and we’re just as excited!